Boys High School Basketball League came to a sudden ending yesterday when the Department of Education (DOE) Athletic Department canceled a game between the Samoana Sharks (9-0) and the Leone Lions (6-2) because the Tafuna High School gymnasium's basketball court was extremely wet. "The game between these two teams was actually unnecessary because with if Leone did defeat Samoana, it wouldn't affect Samoana's #1 standing, and Leone would remain the #2 seed," explained the athletic department coordinator, Mac Ane. On Wednesday, the athletic department also canceled the game between Leone and Marist, because of same wet conditions. "It is the priority of DOE to prevent injury to any student-athletes, so that is why we canceled games or postponed them. That game between Leone and Marist would have affected no standings," stated Ane. The significant game that day played at Samoana High School gymnasium was between the Faga'itua Vikings (5-4) and the Nu'uuli PolyTech (NPT) Wildcats (4-5). It was the deciding game for the last playoff spot. (b) If Faga'itua wins, then they are in the playoff. NPT's hope for the playoff was denied by Faga'itua when they beat them in a tough and close game. 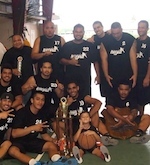 Faga'itua triumphed 57-52 when they were able to hold off NPT in the last quarter surge. Samoana will go up against the winner of the Leone versus Faga'itua game which will be played at Tafuna High School's gymnasium at 3:30pm, as a home-court advantage for the #2-seeded Leone. The final will be played at Samoana's home court on Wednesday at 3:30pm. Leone and Faga'itua split their series this year, when Faga'itua beat Leone in the first round, and Leone returned the favor in the second round. Unfortunately, both of them have been outmaneuvered by the undefeated Samoana. In the Junior Varsity (JV) division, the undefeated Leone (8-0) ran way with the championship, followed by Samoana (6-2), Faga'itua (5-3), Tafuna (4-5), and NPT (0-8). DOE Athletic Department would like to give a big 'fa'amalo' to all the teams for a successful season. "I would like to commend all the teams for their competitive efforts and sportsmanship during the 2004 basketball season, and also to all the coaches for your time and exertion to provide coaching for our high school youngsters." Complimenting Mac Ane. Faga'itua should contained Leone's excellent passing game on all phases of their attacking options. Excellent passing is Leone's trademark, which randomly opens up scoring lanes for their low post players. Leone have shown great improvement since their opening game loss to Faga'itua until their first round meeting with Samoana, where they recorded their second loss in a terrible overall performance. Faga'itua's most dreaded weakness is from the line - they are a 45 percentage free-throw team. Their outside shootings provided the scores, but they lack dominance in the middle. And if they improve this against Leone, then they might have a chance to face Samoana in the final.